In today’s age of customer-centricity, the number one factor that retail stores compete for is the loyalty of their customers. With a shift in power moving towards the consumers’ choice, retail stores must adapt to customers, and tailor their services as much as possible. If a business cannot provide its customers with a positive experience, it can lose out to the competitors who do. This article will focus on using customer feedback and growing your business with every happy customer you’ve served. Having the basic knowledge and understanding of how your customers feel about your store and what you have to offer is important. It allows you to truly be able to know when and how things need to change within your business. It was found that for every one customer who complains about a business, there are 26 who stay silent about their negative experience, and these consumers will likely switch to a competitor. With this lack of feedback, your business must offer its customers a way to voice their opinions. In doing so, your customers feel as though they are an important part of your business, and this helps you find the right ways to shape up your store. Here are a few ways to acquire customer feedback, and what to do once you have it. The best way to receive feedback from customers is to ask! However, depending on how you approach your customers, you may be met with mixed reactions. You have to be firm yet accommodating, as many customers will be under the impression that this process will take a long time. No one wants to be stuck filling out a form for a rusty suggestion box! You need to make sure that your survey is conducted within 24 hours of your customers’ visit. This is to ensure that their responses are as precise as possible. By having a quick and simple interface for your customers to submit their feedback, there’s a much higher chance that they’ll comply. A study notes that the response rate can increase 85% when a survey is well executed, and this is important to get the necessary data. Just like how the format of your survey needs to be simple, the questions themselves must be equally as straightforward. They must provide valuable information, so you, as the merchant, can make improvements to your business. Ask your questions in a way that data can easily be extracted from them. For example, asking your customers in person makes it harder to record the data and get accurate feedback, as customers may not feel comfortable expressing their true opinions in the moment. Additionally, if your questions are too general, or they’re not geared towards store improvement, your survey won’t be of much help for your business. The bottom line is, building surveys are quite a complicated, task better left for professionals. Therefore, a great way to get feedback from your customers is the commonly used Net Promoter Score (NPS). The NPS is a one question survey that asks customers to rate a business from 0-10. The survey determines how likely they’ll refer your business to a friend or family member. This is the easiest and best way to get the right information from customers and is used frequently by a number of large companies. Because the NPS is only a single question, it makes it more appealing for consumers and increases their willingness to spend the five seconds it takes to answer it and provides you with vital customer feedback. Automating the process and ensuring consumers answer within the 24-hour mark mentioned above is important to ensure high participation. That’s where a customer loyalty program can come in hand and be very useful. With a loyalty 3.0 system, you can send an automatic email that includes the NPS Survey, which will be sent to your customers right after a purchase. The system will react based on the customer’s response, so if the score is negative, it can offer future discounts to bring them back to the store. Customer feedback is made to help merchants as well as to let other (potential) customers know about their experience. Savvy merchants use reviews to improve operations0. 92% of consumers now read online reviews, so it’s important that your existing customers speak positively about your business on public domains. A study found that 90% of consumers say that positive reviews from other customers influence their purchasing decisions. This is one of the best forms of promotion for your store, as it comes directly from customers. There is an unsaid trust between consumers, and businesses should strive to take advantage of this relationship. 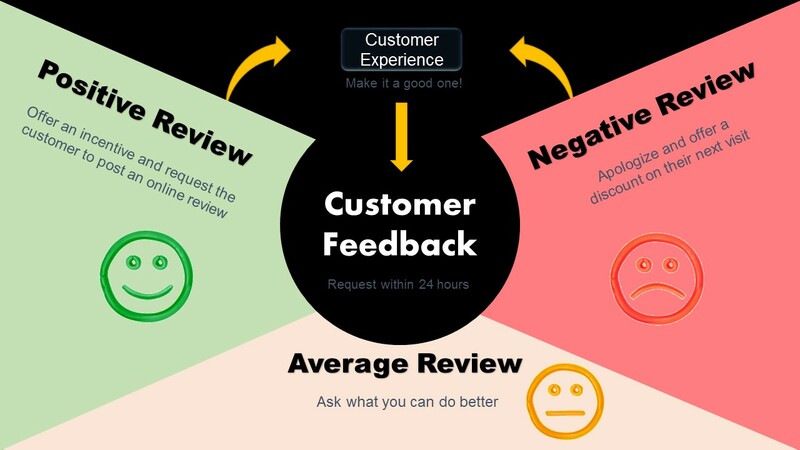 SO YOU GOT SOME CUSTOMER FEEDBACK… NOW WHAT? With the right methods of feedback acquisition, you’ll now have information from your customers that you’ll be able to apply to your business. Whether they are positive or negative, the responses you receive from your customers can truly improve your business, as you’ll be getting evaluations from the people that interact with your store the most. Following up on feedback is equally as important as getting it, and how you do it can impact your relationship with customers. Positive customer feedback is what your business will strive for, but even once you’ve gotten it the job isn’t over yet! Once your business has received a good review, whether it be online, through a survey or other means, send a follow-up message to the customer to thank them for their kind words. This will go a long way in strengthening your relationship with loyal customers and creates more of a reason for them to continue coming to your store. Additionally, you’ll want to encourage your loyal customers who have just had a positive experience at your store to post a review online on websites such as Yelp!. This is to ensure that prospective customers will have a good impression of your store when they go to research it. Offering an incentive such as a small discount is a good way to entice your customers to do so, and it’ll help to foster a good relationship. This is critical for positive reviews online! On the other hand, if you’ve received negative feedback from a customer, you’ll have to work overtime to not only fix the situation but also mend the relationship at hand. The good news is that if you can resolve a customer’s complaint, 70% of the time they will do business with you again. But you have to act fast! As an example, if you receive a low NPS rating from a customer, send them an email the same day to apologize for their negative experience, and offer them a discount to get them back into the store. If they’ve written an unfavorable review online, make sure to respond to it publicly. That way other customers can see that you take the time to treat your customers well. Once a customer comes into your store, you should provide them with every reason to come back. To increase that chance you’ll need to know if they had a good or bad experience, and your actions will determine the kind of long term relationship you’ll have with your customers. Feedback is a powerful tool for businesses to use, as they can take cues from those who directly interact with their store the most, and tailor it to their needs. How a merchant goes about acquiring feedback, and what they do with it once received, is very important. When collected and utilized correctly, feedback provides the ultimate opportunity for businesses to grow, and foster a relationship with its customers. For any questions or concerns regarding this article, please contact us at pr@tapmango.com. Get the grill fired up, get your polos pressed, and prepare your best puns because Father’s Day is just around the corner. From survival kits to dad joke contests, we’ve compiled dad-approved marketing ideas to get the word out and drive traffic to your business. Harness the power of your loyalty program with Father’s Day campaigns that will pop out to pops everywhere. 1. Offer a Dad Kit Courtesy of @cakepopsladulceria on Instagram Good gift ideas for dad are sometimes less obvious than what would work for mom. If your customers are looking for more than a funky tie, bundled products or services are a good way to cover multiple bases…. Are You Getting the Most Out of Your Lightspeed Integration?